Mark Alexander is Professor of Civil Engineering at the University of Cape Town (UCT) and Director of the Concrete Materials and Structural Integrity Research Unit at UCT. He is a Fellow of the University of Cape Town and a registered Professional Engineer in South Africa. He teaches and researches in cement and concrete materials engineering relating to design and construction, with interests in concrete durability, service life prediction, concrete sustainability, and repair and rehabilitation of deteriorated concrete structures. He publishes regularly in local and international journals, and is President of RILEM, an international organisation linking experts and promoting research in civil engineering across 70 countries. 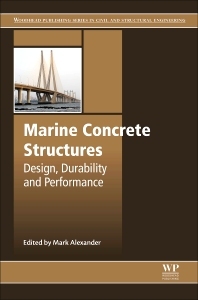 "This book will be a useful volume for practitioners undertaking the design, construction and maintenance of marine concrete structures as it provides a concise logical analysis of the challenges faced, together with solutions that can be employed in ensuring the durability of marine concrete structures. The book comprises three parts, providing a seamless transition from design and specifications, to performance and properties of concrete, to practical case studies on marine concrete and durable marine concrete design. It covers the fundamental requirements and theory, material and concrete requirements, and practical methods required to effect durable concrete marine structures. The book provides an excellent collation of thought-provoking facts and insights into the durability of marine concrete structures. It adds significantly to one’s overall understanding of marine concrete durability, the potential pitfalls and solutions that can be employed to ensure the durability of marine concrete structures. It further provides useful and germane cross references which can assist in deepening one’s understanding in particular areas.